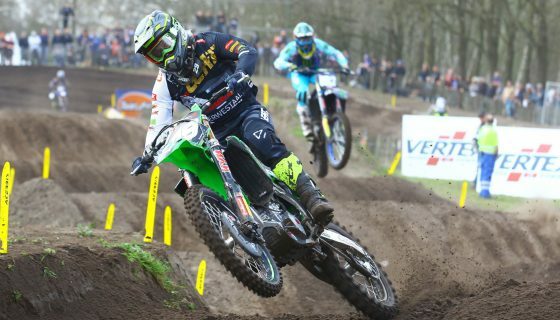 Lawrence and Dankers win EMX Round of the Netherlands as Benistant was Crowned Champion. 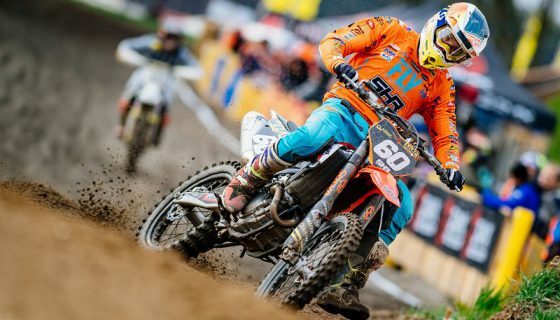 The 2018 MXGP of the Netherlands was full of action throughout the weekend and the European Championships of EMX125 presented by FMF Racing and EMX250 added to massive racing event. Team Suzuki Germany’s Jett Lawrence and RD10’s Raivo Dankers took advantage of their final opportunities of the season and claimed the respective overall wins today in Assen. The final rounds of the 2018 season for both European Championship classes provided great racing in front of a massive crowd over the pair of Dutch race days. 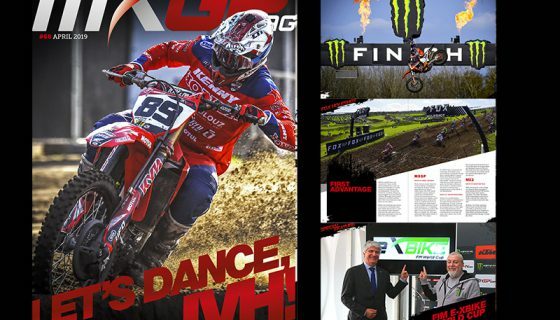 While the EMX250 Champion Mathys Boisrame from Honda Redmoto Assomotor was crowned at the penultimate round of Bulgaria weeks ago the EMX125 presented by FMF Racing title was yet to be decided. 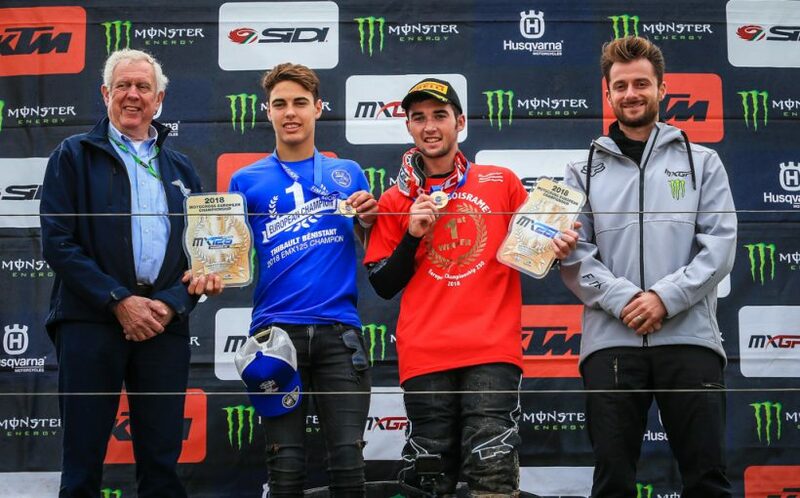 This weekend not only crowned Yamaha Europe EMX125’s Thibault Benistant the new 125 champion but also sealed the championship result of both classes for the entire field. The previous round of the EMX250 Championship in Bulgaria crowned Honda RedMoto Assomotor’s Mathys Boisrame 2018 champion a few weeks ago leaving the weekend open for others to take the final win of the season. 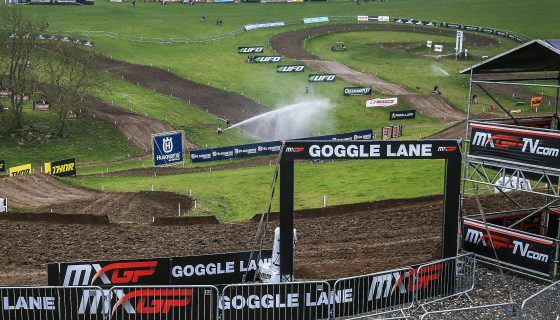 The finale was taken advantage of first by Team DIGA Procross’ Dylan Walsh but Team Suzuki Germany’s Jett Lawrence took the spot by the end of the first lap. LRT KTM’s Tom Vialle then took the lead from Lawrence before Walsh went out with a mechanical issue. 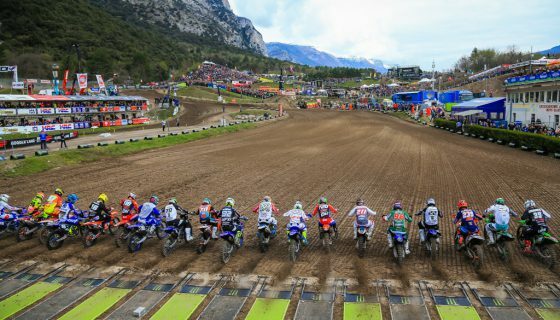 Several riders were swallowed up by the technical sand such as KTM Silver Action’s Gianluca Facchetti and BUD Racing Monster Energy’s Brian Moreau. Creymert Racing’s Kevin Horgmo took third position from WZ-Racing’s Jeremy Sydow while Lawrence reclaimed the lead and won the race by 13 seconds. Taking second was Vialle followed by Horgmo and Sydow while the series champion, Boisrame, finished 19th. Today Lawrence took the lead and held on to it until the finish under the watchful eye of Horgmo who ran 2nd the entire race as well. Vialle was again riding strong in 3rd but a mistake dropped him to 9th. The 3rd place spot of Vialle was then given to Apico Honda Factory Racing’s Steven Clarke ahead of Walsh in 4th. Gold plate holder Boisrame had a much better race 2 with a top ten start he moved from 9th all the way up to 4th past MX88 Carglass Honda Racing’s Freek van der Vlist. At the finish double race wins gave Jett Lawrence his first EMX250 Overall win ahead of Horgmo and Clarke. In the overall top three Lawrence and Horgmo again took the top 2 spots but Vialle took 3rd with his 2-7 finishes. EMX250 Race 1 Top 10: 1. Jett Lawrence (AUS, Suzuki), 29:59.962; 2. Tom Vialle (FRA, KTM), +0:13.121; 3. Kevin Horgmo (NOR, KTM), +0:19.664; 4. Jeremy Sydow (GER, KTM), +0:20.825; 5. Alberto Forato (ITA, Honda), +0:22.458; 6. Erik Willems (BEL, Husqvarna), +0:30.519; 7. Todd Kellett (GBR, KTM), +0:33.302; 8. Mikkel Haarup (DEN, Husqvarna), +0:35.824; 9. Caleb Grothues (AUS, Yamaha), +0:43.782; 10. Josiah Natzke (NZL, Honda), +0:46.647. EMX250 Race 2 Top 10: 1. Jett Lawrence (AUS, Suzuki), 29:48.870; 2. Kevin Horgmo (NOR, KTM), +0:02.580; 3. Steven Clarke (GBR, Honda), +0:54.657; 4. Mathys Boisrame (FRA, Honda), +0:57.423; 5. Mikkel Haarup (DEN, Husqvarna), +0:59.377; 6. Freek van der Vlist (NED, Honda), +1:07.073; 7. Tom Vialle (FRA, KTM), +1:08.327; 8. Martin Barr (GBR, Husqvarna), +1:09.381; 9. Caleb Grothues (AUS, Yamaha), +1:10.155; 10. Mel Pocock (GBR, Husqvarna), +1:11.486. EMX250 Overall Top 10: 1. Jett Lawrence (AUS, SUZ), 50 points; 2. Kevin Horgmo (NOR, KTM), 42 p.; 3. Tom Vialle (FRA, KTM), 36 p.; 4. Mikkel Haarup (DEN, HUS), 29 p.; 5. Caleb Grothues (AUS, YAM), 24 p.; 6. Todd Kellett (GBR, KTM), 22 p.; 7. Alberto Forato (ITA, HON), 22 p.; 8. Steven Clarke (GBR, HON), 21 p.; 9. Mathys Boisrame (FRA, HON), 20 p.; 10. Martin Barr (GBR, HUS), 20 p.
EMX250 Championship Top 10: 1. Mathys Boisrame (FRA, HON), 366 points; 2. Mel Pocock (GBR, HUS), 312 p.; 3. Roan Van De Moosdijk (NED, YAM), 274 p.; 4. Martin Barr (GBR, HUS), 273 p.; 5. Steven Clarke (GBR, HON), 264 p.; 6. Dylan Walsh (NZL, HUS), 239 p.; 7. Brian Strubhart Moreau (FRA, KAW), 237 p.; 8. Tom Vialle (FRA, KTM), 227 p.; 9. Pierre Goupillon (FRA, KAW), 205 p.; 10. Kevin Horgmo (NOR, KTM), 191 p.
EMX250 Manufacturers: 1. Honda, 453 points; 2. Husqvarna, 441 p.; 3. KTM, 392 p.; 4. Yamaha, 376 p.; 5. Kawasaki, 328 p.; 6. Suzuki, 155 p.
Two days of racing scheduled Race 1 of EMX125 presented by FMF Racing as the first EMX event Saturday morning and all eyes were on Yamaha Europe EMX125’s Thibault Benistant and Maddi Racing Husqvarna’s Mattia Guadagnini. The red plate holder Benistant came into the race with the chance to become Europe Champion and Guadagnini was the only one who could potential spoil the party. When the racing kicked off however it was neither Benistant or Guadagini in the lead, it was instead F4E Racing KTM’s Kjell Verbruggen. Guadagnini was all the way back in 14th on the first lap while Benistant was well outside the points scoring positions in 26th. The poor starts combined with the challenging sand of Assen created a massive amount of work for the Frenchman and the Italian. Benistant moved his way forward but so too did Guadagnini. Guadagnini made it up to 7th after his 14th place start and Benistant went from 26th to 17th but fell on the last lap still finishing 20th position for a single championship point. The single point however was the only one needed to give the 26-point gap required to clinch his first ever European championship title in dramatic fashion. Verbruggen won the race with Filip Olsson 2nd, Yamaha Europe EMX125’s Rick Elzinga 3rd, RD10’s Raivo Dankers 4th, and F4E Racing KTM’s Mario Lucas Sanz in 5th. Today’s Race 2 started off with yesterday’s 4th place finisher Dankers in the lead with Matias Versterinen chasing along with Motoblouz HB Racing’s Florian Miot. Versterinen held a strong second as Dankers was long gone for 12 laps but on the 13th both Miot and Elzinga went past to take over 2nd and 3rd. The new champion, Benistant, started race 2 in 16th and quickly worked his way through the field to 8th were he slotted in behind Guadagnini. At the Finish it was a race and overall win for Dankers with Miot second, and Elzinga 3rd. The Overall podium led by Dankers was completed by Elzinga with his 3-3 finishes and Verbruggen with his win in race 1 and 6th in race 2. EMX125 Presented by FMF Racing Race 1 Top 10: 1. Kjell Verbruggen (NED, KTM), 29:52.376; 2. Filip Olsson (SWE, Husqvarna), +0:01.008; 3. Rick Elzinga (NED, Yamaha), +0:18.741; 4. Raivo Dankers (NED, KTM), +0:34.695; 5. Mario Lucas Sanz (ESP, KTM), +0:50.480; 6. Mike Gwerder (SUI, KTM), +0:54.219; 7. Mattia Guadagnini (ITA, Husqvarna), +0:55.047; 8. Lion Florian (GER, KTM), +0:57.676; 9. Tom Guyon (FRA, KTM), +0:59.916; 10. Oriol Oliver (ESP, KTM), +1:07.566. EMX125 Presented by FMF Racing Race 2 Top 10: 1. Raivo Dankers (NED, KTM), 30:11.381; 2. Florian Miot (FRA, KTM), +0:13.746; 3. Rick Elzinga (NED, Yamaha), +0:17.612; 4. Matias Vesterinen (FIN, KTM), +0:28.880; 5. Raf Meuwissen (NED, KTM), +0:33.604; 6. Kjell Verbruggen (NED, KTM), +0:33.654; 7. Mattia Guadagnini (ITA, Husqvarna), +0:47.227; 8. Thibault Benistant (FRA, Yamaha), +0:55.572; 9. Petr Polak (CZE, KTM), +1:00.850; 10. Lion Florian (GER, KTM), +1:03.262. EMX125 Presented by FMF Racing Overall Top 10: 1. Raivo Dankers (NED, KTM), 43 points; 2. Rick Elzinga (NED, YAM), 40 p.; 3. Kjell Verbruggen (NED, KTM), 40 p.; 4. Florian Miot (FRA, KTM), 29 p.; 5. Mattia Guadagnini (ITA, HUS), 28 p.; 6. Lion Florian (GER, KTM), 24 p.; 7. Mario Lucas Sanz (ESP, KTM), 24 p.; 8. Filip Olsson (SWE, HUS), 22 p.; 9. Raf Meuwissen (NED, KTM), 21 p.; 10. Tom Guyon (FRA, KTM), 21 p.
EMX125 Presented by FMF Racing Championship Top 10: 1. Thibault Benistant (FRA, YAM), 249 points; 2. Mattia Guadagnini (ITA, HUS), 224 p.; 3. Rene Hofer (AUT, KTM), 202 p.; 4. Raivo Dankers (NED, KTM), 194 p.; 5. Tom Guyon (FRA, KTM), 189 p.; 6. Petr Polak (CZE, KTM), 186 p.; 7. Filip Olsson (SWE, HUS), 156 p.; 8. Emil Weckman (FIN, KTM), 150 p.; 9. Lion Florian (GER, KTM), 145 p.; 10. 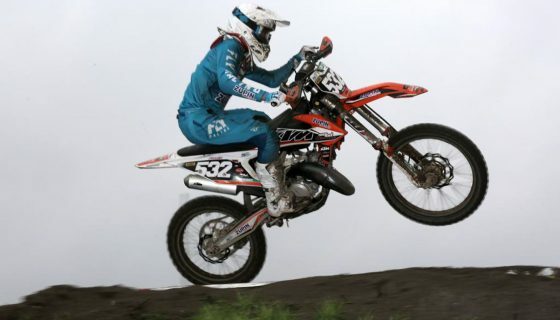 Raf Meuwissen (NED, KTM), 141 p.
EMX125 Presented by FMF Racing Manufacturers: 1. KTM, 375 points; 2. Husqvarna, 311 p.; 3. Yamaha, 285 p.; 4. TM, 15 p.